Yuh-Line Niou secured a landslide victory in Tuesday's primary election. NEW YORK CITY — Voters in the district of disgraced former Assemblyman Sheldon Silver rejected a candidate closely associated with him while Democratic Congressional nominee Adriano Espaillat cemented his political influence by helping two Latina women — Marisol Alcantara and Carmen De La Rosa — win their state Senate and Assembly primaries. Neighborhoods across the five boroughs saw key state legislative races decided Tuesday night in the city's third primary election of the year. Some Democratic candidates now face little to no opposition on the Republican side, virtually assuring them of a win in November's general election. 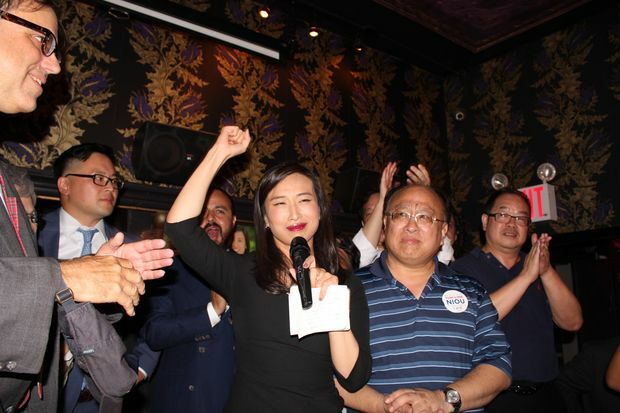 Voters in Silver's old district, which spans the Lower East Side, Chinatown and much of Lower Manhattan, voted to send Yuh-Line Niou, former chief of staff to Queens Assemblyman Ron Kim, to Albany. In April, Alice Cancel, a longtime Democratic District leader, won a special election for Silver’s seat, after he was convicted by a federal jury on a host of corruption charges. But the power of incumbency didn't work Tuesday for Cancel who was in fourth place with just 12 percent of the vote with almost all the election districts reporting. Niou led the way with 32 percent of the vote and received 1,700 more votes than Cancel. Jenifer Rajkumar, a human rights lawyer and an adjunct professor at CUNY, came in second, securing 19 percent of the vote with more than 1,600 ballots cast in her favor, in the six-way race. Just as Silver's coattails were being snipped in downtown Manhattan, Espaillat's grew much longer Uptown. Alcantara, a longtime labor and community organizer, won a tight 31st Senate District primary race against two experienced political operators: former Councilman Robert Jackson and Micah Lasher, chief of staff for Attorney General Eric Schneiderman. With all but one election district reporting, Alcantara had 32 percent of the vote, with 8,309 ballots cast in her favor to Lasher's 30 percent and 7,737 ballots. Jackson, a close third, also had 30 percent of the vote and 7,616 ballots. “I am honored that the voters of this district have put their trust in me today, and I am so thankful for the volunteers who powered our grassroots campaign," said Alcantara. "Together, we’ve made history, and taken an important step forward toward a state Senate that reflects the diversity of New York." Alcantara will join the Independent Democratic Conference, which is currently aligned with Republicans. The group's party campaign committee, the Independence Campaign Committee, spent heavily to fund Alcantara. Days before the primary, the committee accepted a $100,000 donation from conservative Republican Thomas McInerney, a regular donor to Republican guru Karl Rove's Super PAC and the New York Republican State committee. Jackson's campaign criticized Alcantara for accepting money from someone "who has sought to obstruct President Obama at every turn." De La Rosa, running in the 72nd Assembly District Primary ousted incumbent and long-time Espaillat foe Guillermo Linares by 1,300 votes, receiving 46 percent of the vote, or 4,414 ballots. Linares had 32 percent of the vote and 3,099 ballots even though he had heavy labor union support. "This is the year of the women and as we look toward the future of our state government we are in good hands," Espaillat told DNAinfo New York. He described Alcantara and De La Rosa as "progressives who will fight for tenants, working and middle class New Yorkers" who also "care deeply about the communities they will represent." 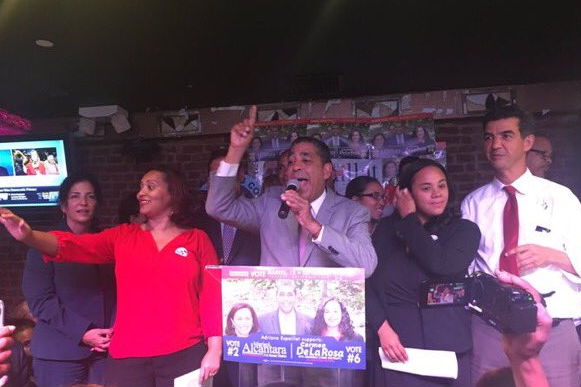 The victories show how Espaillat, who will in November likely become the first Dominican-born person elected to Congress in the heavily Democratic district, has quickly sought and achieved the role of kingmaker just a little over two months after his own close primary victory. Tuesday's sweeps are a sign of strength for Espaillat and could ward off potential challengers two years from now. "This solidifies power for Espaillat and gets him moving in the direction he wants to go, which is empire building," said Evan Thies, co-founder of Pythia Public Affairs. Silver became one of the most powerful men in state politics during his 40 years in the seat. With Niou now the Democratic nominee in the heavily Democratic district, it looks like all Silver's ties have been severed. Cancel vowed to fight on and even seemed to hint at another run for the seat. In Southeast Queens’ 10th Senate District, incumbent Democrat Sen. James Sanders Jr. pulled out a victory against Adrienne Adams, chairwoman of Community Board 12, even though the Queens County Democratic Party backed Adams. With almost all election precincts counted, Sanders had 57 percent of the vote to Adams' 41 percent. The Queens County Democratic Party backed Adams after Sanders, a former City Councilman, declared last year that he was planning to challenge Queens Rep. Gregory Meeks this fall. But Sanders, who eventually pulled out of the congressional race, has wide name recognition in the district and secured a number of labor endorsements to help him withstand the powerful Queens Democratic machine. ► Lifelong Windsor Terrace resident Bobby Carroll cruised to a win in the 44th Assembly District, garnering 86 percent of the vote. ► On the Upper West Side, incumbent Assemblywoman Linda Rosenthal easily won the Democratic primary, fending off a challenge from candidate Eugene Byrne. ► On the Upper West Side, incumbent Assemblyman Daniel O'Donnell defeated challenger Steven Appel. ► In Staten Island, Republican incumbent Assemblyman Ron Castorina Jr. beat South Shore Civic Association president Janine Materna for the 62nd Assembly District. According to state election results with all precincts reporting, Castorina had 68 percent of the vote compared to 32 percent for Materna. ► In Queens' 30th Assembly District, incumbent Assemblywoman Margaret Markey — who has served nine terms in Albany — lost to Brian Barnwell, who told DNAinfo last week he felt the district "needed a better representative." Barnwell won with nearly 64 percent of the vote, pulling out 1,622 votes compared to 921 for Markey. The district includes Maspeth, Woodside and parts of Long Island City, Astoria, Sunnyside and Middle Village. ► In the 55th Assembly District, which covers Ocean Hill and Brownsville, incumbent Assemblywoman Latrice Walker won with more than 72 percent of the vote over city Councilwoman Darlene Mealy. ► Former state Sen. Hiram Monserrate, who was kicked out of the state Senate in 2009 after he was convicted of assault, barely lost his bid for district leader and a political comeback by only 57 votes, according to the election results. The former pol was running for the unpaid position throughout Corona and Jackson Heights against incumbent George Dixon. Dixon picked up 775 votes, while 718 people voted for Monserrate. ► In North Brooklyn, incumbent State Senator Martin Dilan fended off his second time challenger Debbie Medina, a neighborhood housing advocate with Los Sures. Dilan earned around 55 percent of the vote, while Medina took in just under 40 percent of democratic votes in the 18th Senate District, which covers parts of Bushwick, Greenpoint, Williamsburg and Cypress Hills. ► In the 25th State Senate district, which stretches from Red Hook and Sunset Park to Bed-Stuy, Democratic incumbent Velmanette Montgomery cruised to victory with 65 percent of the vote as compared to 29 percent for her challenger, Michael Cox. DNAinfo staff reporters Jeff Mays, Katie Honan, Allegra Hobbs, Irene Plagianos, Emily Frost, Gwynne Hogan, Leslie Albrecht, Ewa Kern-Jedrychowska and Camille Bautista contributed reporting.